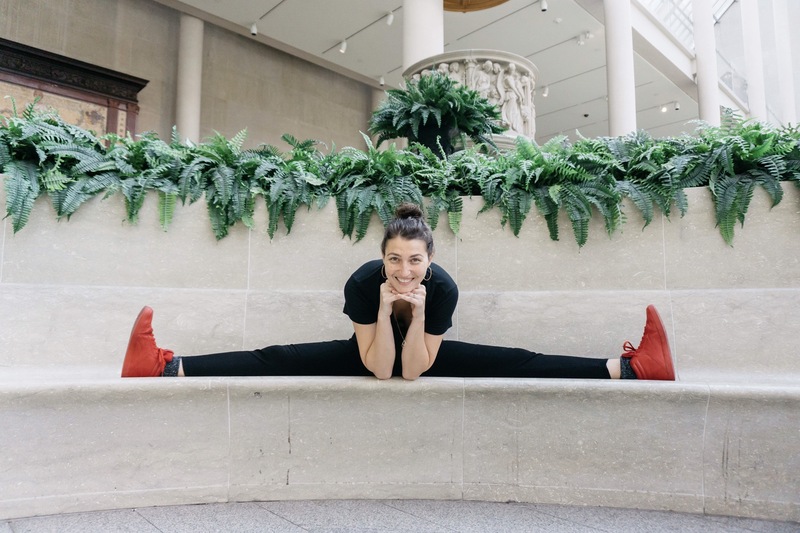 Monica Pirani is a Queer identifying yoga teacher, who is making space for her students and fellow teachers to feel seen and heard. She is based in New York City but traveling abroad for the Summer and Fall of 2018. In New York she teaches at Sky Ting, Jewel City and HealHaus. I met Monica through Instagram and took her class in Chinatown on a snowy Winter day. I loved her peacefulness in the studio and the conversation we shared over breakfast. Here’s a bit of what we talked about. It’s refreshing to read your posts and stories about integrity and respect for individuality online. Can you share about your journey of finding confidence and freedom of expression in your gender identity? ￼I didn’t always feel I could be proud and now have gotten too tired to not be. I’m grateful that in my work I can be out, proud and Queer. I have younger siblings who are Queer. When I helped raise them I encourage them to be proud of their Queerness. I got tired of being told I wasn’t Queer enough or too Queer by the Gay community and straight community. I finally decided my Queerness is valid and I’m going to say it because I’m tired of being dismissed. I’m Queer and that’s awesome. Everything I do is Queer. When I sit on the train, I sit in a Queer fashion. When I brush my teeth, I brush like a Queer. Everything I touch and do is Queer. The more we normalize that in conversation the better it is for everyone. When we say we’re proud of being Queer it’s an acknowledgement that we’re permitting ourselves to feel joyful about Queerness. So much of being Queer comes with a lot of pain and trauma. That’s not to say every day I’m happy to be a Queer person. I’m grateful for who I am and I love who I am but it does come with being marginalized and microaggressions. It’s important in the face of those things to allow yourself to feel joy and proud of you are. On social media your bio reads “💜 Queer and Proud (she/her), 🗒 Writer + Creative, 🌺 Plant Lover, 🙌🏽 Yoga & Meditation Teacher” Has putting your identity out there sparked new relationships or internal shifts of personal understanding? ￼I remember initially being nervous about sharing who I am. It’s definitely created conversations I previously had in private that are now public. I’ve noticed students, friends, family members and strangers come forward and thank me for sharing information about being Bisexual, Queer, Transgender, Non-binary or gender fluid. I’ve found my students are either people who have family members who are queer or who are queer themselves. It’s been positive overall. There are definitely scary moments. The benefit is that other people can come forward and know they’re not alone. It’s important to talk about this. I can’t alone fix any of the big issues we as a community face but if I can at least let someone else know they’re not alone then that’s awesome. A part of me coming out and doing all this was because I have the privilege to come out and talk about this stuff. I should be using that for good. If I have the ability to talk about this stuff and have these conversations then I should be having them because it’s not on everyone else to have them and not everyone is in a place to defend themselves. The people with privilege have to come forward and have those discussions, so we can give strength to each other. In the past, you’ve mentioned college was a time for self-education and learning through awesome conversations with Queer people. Can you share how that transformed your relationship with your Queer self? ￼I got to college and met this group of wonderful people who I’m still friends with today. It was my first real exposure to a Queer community. My first relationship was with a Queer person and that was beautiful. I had had other relationships with Queer people but never the community. When I finally found it, I felt like I was home! Our college group was a diverse group of Queer, Straight, Latinx, Black, brown, white women and men. With all our different experiences, we had our own biases whether it was sexism, homophobia, transphobia, biphobia, racism, etc. When someone said something messed up they got called out on it. Arguments would ensue but they were able to be resolved. You need to have a desire to turn towards the uncomfortable conversations and not attach it to you as a person. You need to be able to say I did a bad thing, I’m not a bad person. I can change my bad behavior because I’m a good person and a good person wouldn’t do that. We were open to having those conversations without being shut down. When you start to have those conversations you realize there’s no such thing as being an adult. We all have room to grow. I want to encourage those conversations and build community around compassion, active listening and personal growth. In the last year you hosted a Queer yoga event. Can you share more about it? The event was in June 2017 during Pride. It was called Born This Way: flow for pride. 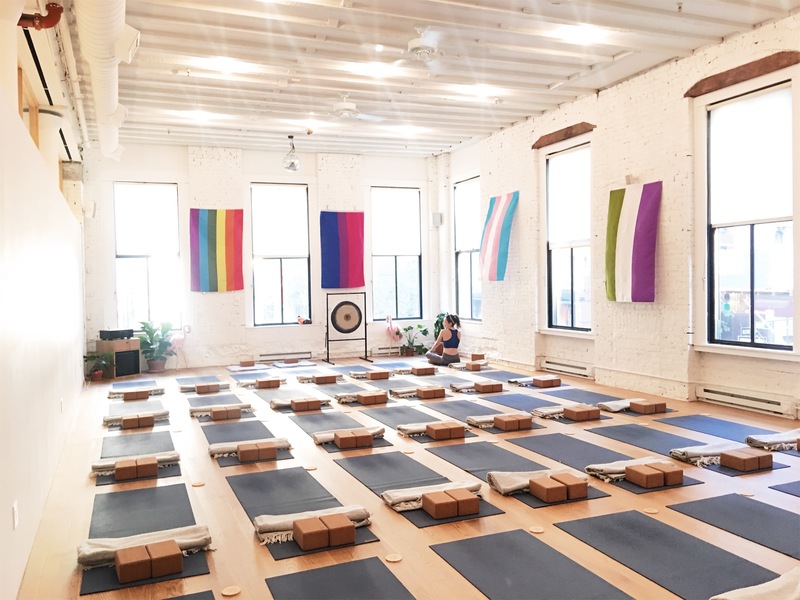 The idea came up when one of my Queer non-binary younger siblings suggested I create a Queer yoga class. The thought had occurred to me but it took hearing my sibling to realize it was a thing I could do. My good friend and fellow yoga teacher Kajuan Douglas agreed to collaborate with me and we turned it into a fundraiser. The community reception was great – we practically sold out. We filled the room with flags of different sexual orientations. It was beautiful. The space felt warm and welcoming. By the end of the class people were coming up and thanking us for the a sense of community we built so quickly. In a short period of time, people, who didn’t know each other, felt safe and welcomed. They felt seen. We took that as success. Since then, it’s made me think about how we don’t have spaces to just be Queer. There is space for white cis gay men, limited space for white cis lesbians. For everyone else in the rainbow, the message is you can join us or go do your own thing. The rest of us don’t always have a space to go exist and be joyful. I’m glad we were able to create that, even if just for a few hours.